Update Sept. 30, 2013: Today marks the long-delayed Croatian-language release of the first volume of Blaz Zgaga and Matej Surc’s “In the Name of the State” trilogy. Publication was delayed, Zgaga explains, because of the influence of arms dealers and threats against one of the Croatian translators. With this new release, Croatian victims of war and war profiteers from the former Yugoslavia will be able to read in their own language about the hidden details of a scandal that continues to haunt the region to this day. ICIJ’s Blaž Zgaga investigated Slovenia’s massive arms smuggling scandal – and turned the story into a best-selling book trilogy. Once the most prosperous socialist country, Yugoslavia fell into a deadly maelstrom of violence and war crimes in 1991. The first major military conflict in Europe after World War II filled headlines for years. 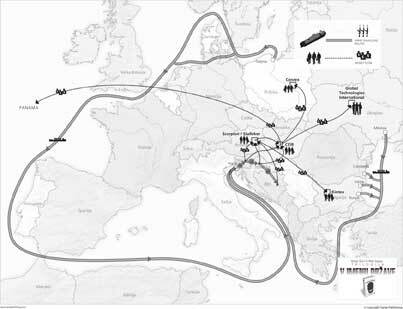 More than 130.000 people died, many more were displaced, and 20 years later the region still looks like a black hole of Europe – riddled with organized crime, corruption and no economic progress. Despite the UN Security Council’s vote for an arms embargo in September 1991, all warring parties were able to continue fighting for years as thousands of tons of ammunition were delivered to the battlefields from foreign countries. Arms smuggling was also a never-ending scandal in Slovenia, so it was a good topic to investigate. With co-author Slovene journalist Matej Šurc we reached a breakthrough in 2009 after we obtained more than 6,000 declassified documents through a Freedom of Information request. These contained mostly hard facts: police, intelligence and diplomatic cables, port authority and shipping documents, cargo manifests, bills of lading, export licences, parliamentary inquiries documents, court files and others. How do we analyse and understand such a huge amount of information? How do you write stories out of so many numbers and data? Creating four different databases in Excel was the most important part of our analysis. The first spreadsheet was an inventory of all weapons and ammunition of the Yugoslav People’s Army with official estimates of production prices — what allowed us to calculate a minimal worth of any documented transport with cargo list. The second focused on sea transports and the remaining two on land transports. The biggest spreadsheet consisted of 269 rows and 17 columns. As 20-year-old documents were usually photocopies of bad quality with many handwritten remarks, we typed all important data into spreadsheets by hand. It was the most boring and tiresome phase of our investigation, but the result was very fruitful. Typing all this data into Excel enabled us to merge data from hundreds of documents. After printing the database on A4 paper and sticking all of the pages together into a huge format, we were able to see the forest, not just the trees. Soon, the first patterns appeared. We found that multiple documents usually described a single transport — what allowed us to reconstruct 20-year-old events. Moreover, some persons started appearing repeatedly in our databases. Cross-border cooperation (with Croatian journalist Saša Leković and Bosnian colleague Esad Hećimović) revealed they were officers of the Croatian army. Some trucks’ registry plate numbers showed up in different databases, which gave us an opportunity to merge them and follow single transports from ship to trucks which were escorted by secret services to the Slovene-Croatian border. Finally, equipped with information from spreadsheet analyses we interviewed insiders and other people involved. Collaborating with Leković and Hećimović enabled us to receive more information; journalists from Switzerland, Poland, Ukraine and Finland also co-operated. When it was time to write, Šurc and I decided on a crime or spy novel narration, and ended up with 44 chapters. Each is a stand-alone story. Finally, with publisher Rok Zavrtanik of Sanje Publishing house, we decided to launch a trilogy titled In the Name of the State. The first book Sell was published on 16 June 2011, the second Re-Sell followed on 27 October 2011, the last Cover-Up was launched on 19 April 2012. They consist of more than 1300 pages combined, with more than 1700 footnotes, 320 documents, maps and many photographs. The findings reveal massive UN arms embargo violations. Many thousands of tons of ammunition were sold from Slovenia to Croatia and Bosnia and Herzegovina in 1991. In the opposite direction, dozens of millions of convertible currencies were delivered in cash. At least 16 ships loaded with arms arrived from Bulgarian, Polish, Ukrainian, Romanian and some other ports. Weapons also came from Russia – including modern SAM and AT missiles with Russian/Soviet official military documentation – and their main supplier was Vienna-based Konstantin Dafermos, whose company Scorpion International Services is an exclusive representative of Russian state-owned company Rosoboronexport today. We uncovered debit credit notes of Scorpion’s account in a Hungarian bank. More than 80 million US dollars of war profits were collected in that account during the UN arms embargo. At least 9 million dollars have been forwarded to Cenrex, a company founded by Polish military intelligence service WSI, and dozens of millions to Global Technologies International company and other accounts of Odessa Mafia. Tiny Slovenia with its only port of Koper was a major logistic hub for massive arms shipments to Croatian and Bosnian Muslims at Yugoslav battlefields. Those shipments changed a military balance in the region. Many of transports were organized by Slovene Ministry of Defence led by Janez Janša, who is the Prime Minister of Slovenia today. According to testimonies of senior intelligence officers, dozens of millions of Deutschmarks in cash had been collected in the Slovene Ministry of Defence, but money disappeared in Austrian and Swiss banks. Some was laundered in the United Kingdom. All books of the trilogy reached the best-sellers list in Slovenia. The third, Cover-Up, was the best selling book in May 2012. Translations into other languages are following soon.